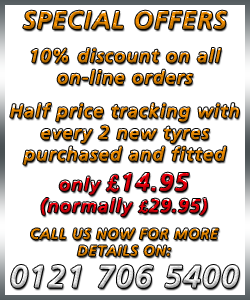 We are a Birmingham based outfit supplying premium brand tyres, exhaust systems and batteries to the public and businesses with vehicle fleets. We also provide vehicle servicing, braking system fitting and maintenance along with our laser alignment and alloy wheel refurbishment services. Our number one aim is exemplary customer service, we are a business that lives or dies on reputation and customer recommendation.